The Murasakishikibu, it is a bitter purple with reddish, such as the fruit of Murasaki Shikibu. 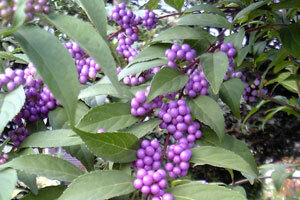 Murasaki Shikibu in the shrub of Verbenaceae native to Yamano, small fruit of purple will overlap a lot. In the past it was called from the way that the “紫敷実” “紫重実”, it seems to have become so that its nickname is called unawares as “Murasaki Shikibu” because it is reminiscent of the Murasaki Shikibu. Could this color name from the color of its fruit. By the way, you shy “deep purple” in very similar plant, but this will be another kind.